Yumm, I just love the color combination in the new Spice Cake Designer Series Paper. Pool Party is one of my favorite new In Color's and it looks just great combined with Soft Suede and Very Vanilla, with a touch of More Mustard and Crumb Cake. This was an easy card to make and I think I will make several more to give to friends and family. I have a feeling I may be re-ordering more Pool Party Ruffled Ribbon soon! 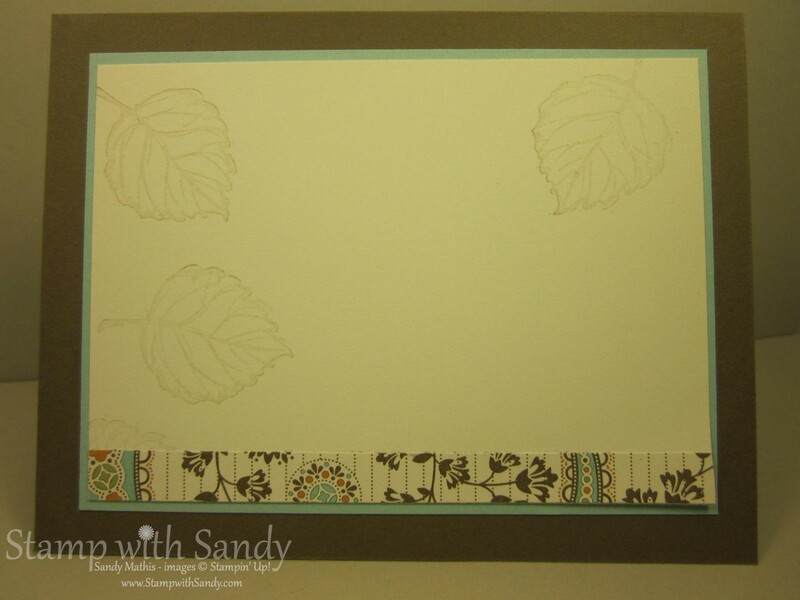 The leaves in the Gently Falling Stamp Set were stamped using the Rock and Roll technique onto Very Vanilla Card Stock. In case you don't know how to Rock and Roll, you ink your stamp in the base color first. For the largest leaf I used Crumb Cake Ink. Then, I rolled the edges only of the stamp onto a More Mustard Ink Pad to give a two-tone effect. The leaf outline was stamped in Soft Suede. Don't neglect the insides of your cards! I used Crumb Cake Ink, stamped off once, for the subtle leaf image in the background. A little scrap of DSP finishes it off. Don't forget your envelopes, either! 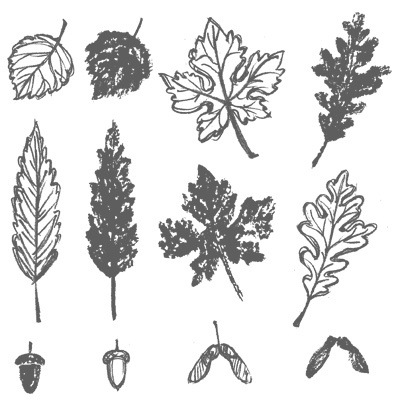 What is easier than stamping one little leaf? The recipient will know that something special awaits inside. 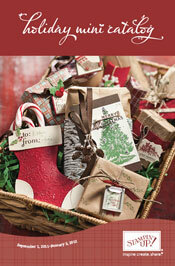 The Gently Falling Stamp Set and Spice Cake Designer Series Paper are offered for a limited time in the 2011-2012 Holiday Mini Catalog. If you don't have a copy and would like to request one, click here. Absolutely stunning, Sandy! What is there not to love about this card! It is perfect! I can't remember how i fell upon ur blog, but it's lovely. So many great projects!!! I wish i could subscribe to receive emails for when u update your blog. I really love what you're doing with this stamp set and the Spice Cake paper! I can see why Pool Party is your new favorite color...so pretty! What a beautiful card! I think I have to get that set now! You make it a must have! Such a lovely fall card! That ribbon is just beautiful with this paper!